Reading this question, Why are there no wheeled animals?, I wondered why no organisms seem to make use of the tensile and other strengths of metal, as we do in metal tools and constructions. I am obviously not talking about the microscopic uses of metal, as in human blood etc. Why are there no plants with metal thorns? No trees with "reinforced" wood? No metal-plated sloths? No beetles with metal-tipped drills? Or are there? Is metal too scarce near the surface? 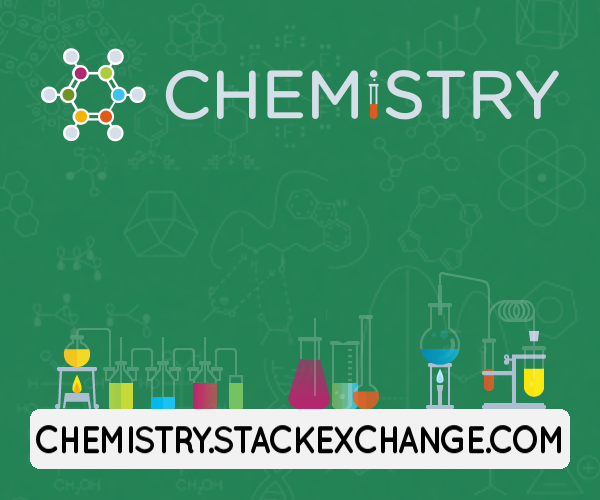 Are there certain chemical properties that make metal hard to extract and accumulate in larger quantities? Is metal too heavy to carry around, even in a thin layer or mesh or tip? Can metal of high (tensile etc.) strength only be forged under temperatures too high to sustain inside (or touching) organic tissue, and is crystallised metal too weak? Are functionally comparable organic materials like horn, bone, wood, etc. in fact better at their tasks than metal, and do we humans only use metal because we are not good enough at using e.g. horn to make armour or chitin to make drills? A bonus question: are there any organisms that use the high electric conductivity of metal? Animals depend upon electric signals for their nervous system, but I do not think nerves contain much metal. The same applies to the few animals that use electricity as a weapon. There are some cases, as hinted at by the comments. But these are relatively small amount of metal. Its not that there is no metal available, but I can think of several reasons you don't see iron exoskeletons on animals all the time. Firstly, fully reduced (oxidation state 0) metal has a high energetic cost to create in reduced form. Iron is the second most common metal after aluminum on the earth's crust but its almost entirely present in oxidized states - that's to say: as rust. Most biological iron functions in the +2/+3 oxidation state, which is rust or closer to it than metal. Cytochromes and haemoglobin are examples of how iron is more valuable as a chemically active biological agent than a structural agent, using oxidized iron ions as they do. Aluminium, the most common metal on earth has relatively little biological activity one might assume because its redox costs are even higher than iron. If there are some reasons why reduced biometal doesn't show up very often, inability of biological systems to deposit reduced (metallic) metals is not one of them. Bone and shell are examples of biomineralization where the proteins depositing the calcium carbonate or other oxides in the material are structured by the proteins to be stronger than they would be as a simple crystal. There are cases of admittedly small pieces of reduced metal being produced by biological systems. The Magnetosomes in magnetotactic bacteria are mentioned, but there are also cases of reduced gold being accumulated by microorganisms. I would say that while iron skeletons might seem to be an advantage, they are electrochemically unstable - oxygen and water will tend to oxidize (rust) them quickly and the organism would have to spend a lot of energy keeping it in working form. Electrical conductivity sounds useful, but the nervous system favors exquisite levels of control over bulk current flow, even in cases like electric eels, whose current is produced by gradients from acetylcholine. What's more, it is a fact that biological materials actually perform as well as or better than metal when they need to. Spider silk has a greater tensile strength than steel (along the direction of the thread). Mollusc shells are models for tank armor - they are remarkably resistant to puncture and breakage. The time it would take for metalized structures to evolve biologically might be too long - by the time the metalized version of an organ or skeleton got started, the bones, shells and fibers we know probably have a big lead and selective advantage. Biological enzymes don't work well on metals. Some often incorporate metals (see chelation) but elemental atoms aren't easy to process. For one, a large molecule would be identical everywhere, so cleavage, for example, would be indiscriminate and just leave a bunch of tiny tiny atoms. More to the point, once an organism incorporates metal there certainly isn't a lot it can do about that. A lot of shell-based organisms swap out their shells because of the inflexibility of those designs, and metal would be no different. It's difficult to grow when you're encased in a self-made iron maiden. There are good reasons why tissues/structures with a very high metal content might cause problems (I defer to the other answers here). However, I am aware of one other example: some molluscs incorporate high concentrations of iron into the points of the radula (basically a ribbon of teeth, used for grazing). This is especially important for grazing molluscs, as they essentially make a living by scraping a thin layer of microalgae directly off the rock surface. Well there is the common Bloodworm (Glycera dibranchiata)which people use for fishing bait. The animals are unique in that they contain a lot of copper without being poisoned. Their jaws are unusually strong since they too contain the metal in the form of a copper-based chloride biomineral, known as atacamite. And unlike the clamworm (Nereis limbata), whose jaws contain the metal zinc, the copper in the mineral in the jaws of Glycera is actually present in its crystalline form. It is theorized that this copper is used as a catalyst for its poisonous bite. Looks like some parasitoid wasps have zinc coated barbs on their ovipositors which may function to help them bore through wood and lay their eggs. parasitoid ovipositor specimens had a weight percentage of zinc of 7.19±3.8% (N=42) in the tip regions, which was significantly higher (P<0.05) than that in pollinator and parasitoid remote regions (<1%; N=10). Gastropod that incorporates greigite, pyrite, and graphite on it's shell and foot. 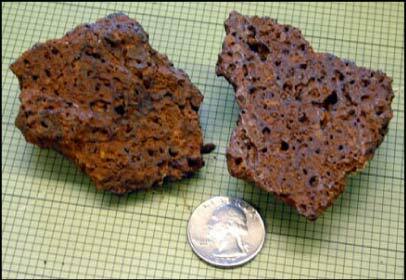 Due to the large quantities of these compounds in dissolved form surround the hydrothermal vents. Speculation for purpose: the shell is extremely resilient, the metal does improve this greatly. Though whether evolution deemed this adaptation necessary because of an abundance of strong predators, or as a means of detoxification of the injested compounds, is unclear. 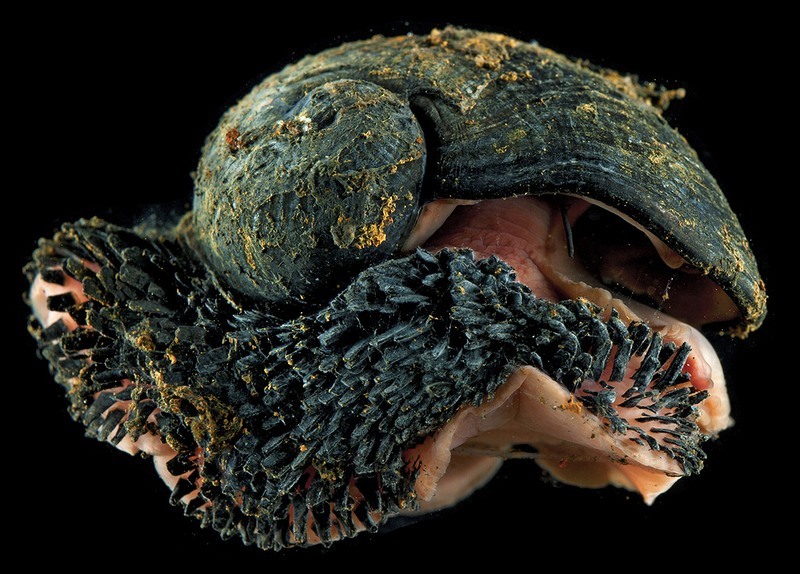 The three populations of these snails have varied compositions, one which even being magnetic, due to the different compounds produced by the vents. 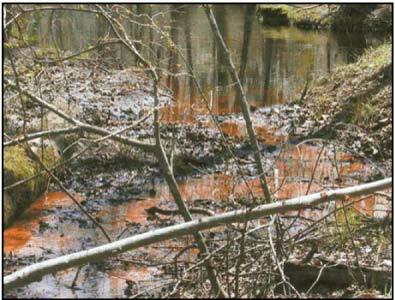 Though not in metallic (0) stage; an Iron ore called "Bog-Iron" is formed via microbial process. It is formed inside bogs and swamps, classically in Sphagnum-moss-bogs. It is also found in peat. 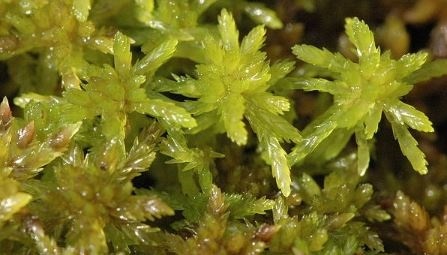 Fig-3: Sphagnum sp, common bog moss of temperate and cold regions. 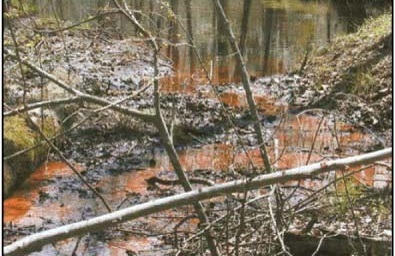 When Fe(2) or ferrous ion, the more soluble form, obtained in the groundwater of bog region from some mineral-source such as spring, the anaerobic iron oxidizing bacteria, such as Gallionella and Leptothrix etc, oxidized it into Fe(3) or ferric form; which very easily get precipitated as insoluble compounds. Fig 4: Spring acts as iron source. (Wikipedia) , (Wikimedia) , (USGS) , (USGS url). Fig. 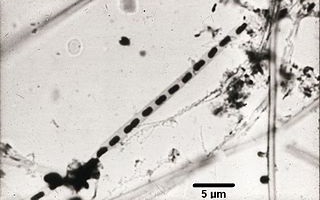 5: Leptothrix sp. , found in ferruginous environment. 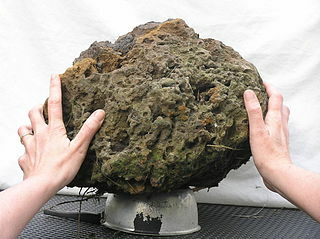 The iron components found in bog-iron, is commonly iron(III) oxyhydroxides (FeO)OH of varying compositions; geologically Goethite and Limonite. Fig. 6: Samples of "bog ore" from Nassawango Creek show vugs lined with goethite around massive "ochre". Have you ever looked up the scaly foot gastropod? It uses iron as a form of body armor. Literally scale armor on It's foot. Not the answer you're looking for? Browse other questions tagged evolution biochemistry physiology speculative bioinorganic-chemistry or ask your own question. Could a biological process organically build solid metal “organs”? How to form biological metallic tissue?